There is a lot of temptation to constantly eat and be merry during the summer months. I like to follow those urges, but really focus on fresh and light food as it is bathing suit season. As summer begins so do the invites to weekend bbq’s, weeknight dinners outside with friends enjoying the warm evenings, and the inevitable thirst for something cold and tasty to cool you down and fill you up. Thus, we have two different “ice creams” here that will work just as well at backyard bbq potlucks, at a fancy dinner party, or in your freezer for an anytime treat. Enjoy! I buy chamomile constantly at the farmers market for tea, but it recently dawned on me at a special dinner at Hinoki & The Bird that its flavor should really be incorporated in food. 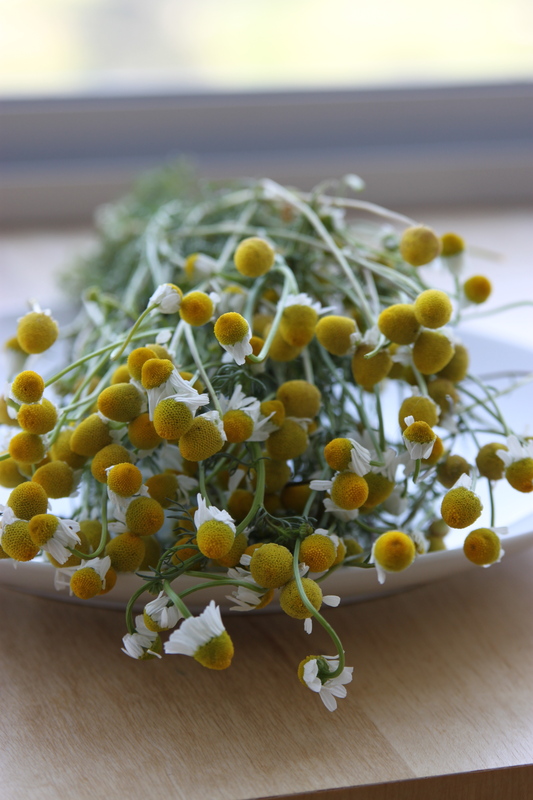 Look for chamomile with bright colored flowers and tender stalks. Some local honey, chamomile, and quality greek yogurt makes for a rich but healthier dessert. Greek yogurt is already so creamy, it eliminates any need for extra fat. A mixture of white nectarines and peaches. In season now! 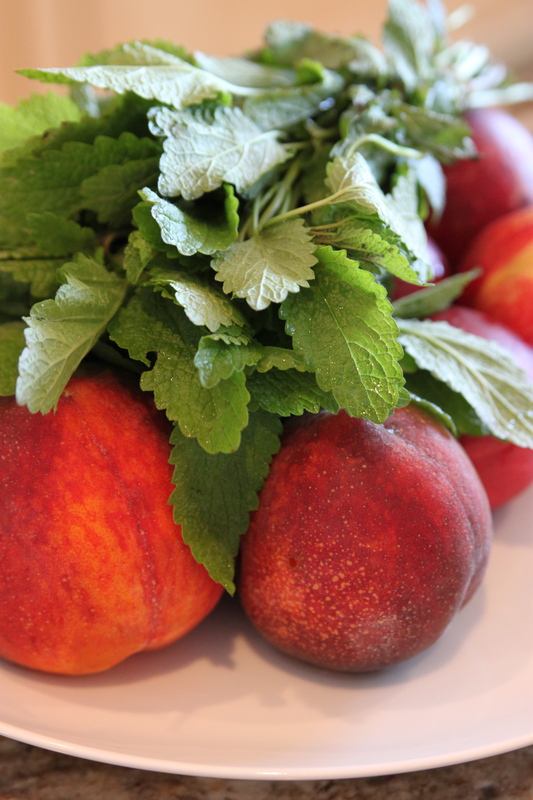 I used Lemon Mint to cut the natural sweetness of the ripe peaches and nectarines–they are crazy sweet from the farmers market. If you can’t find it, use conventional mint and one tablespoon of lemon juice to get the same flavor. Fight the temptation to eat it just like this. 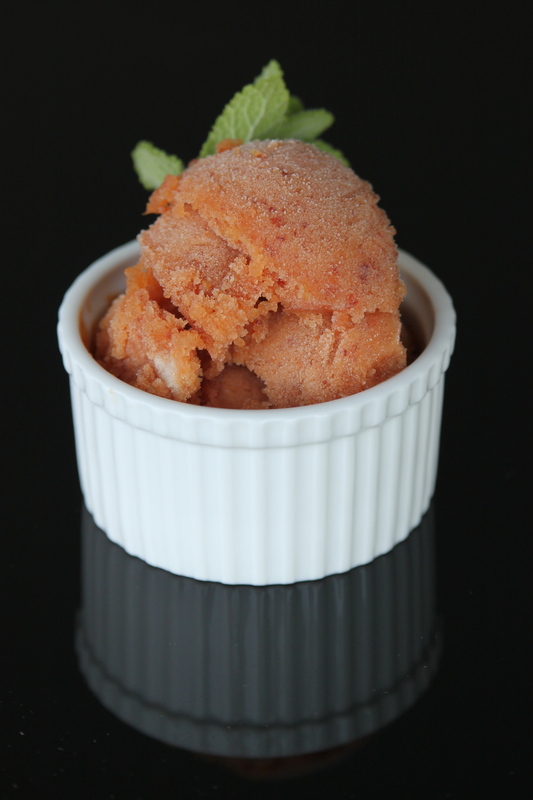 I like to have some texture to the sorbet, but feel free to really blend it if you don’t like small pieces of fruit. Infusing the simple syrup. 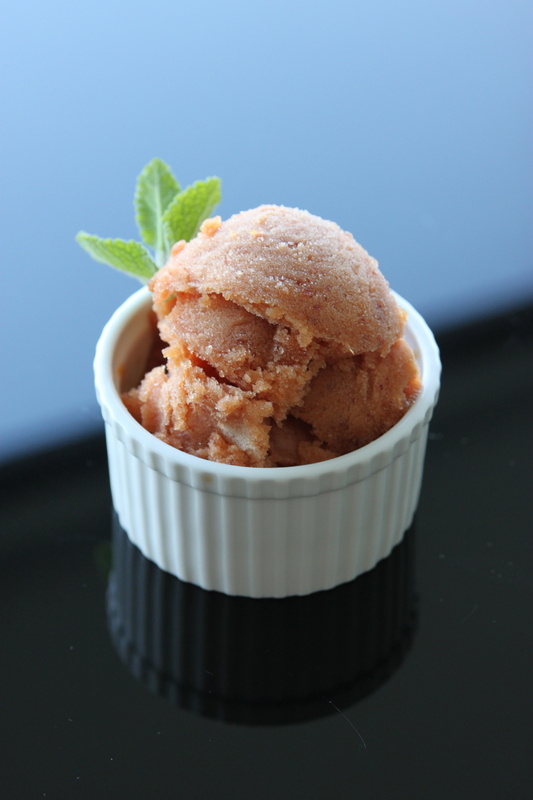 Your sorbet should be much more dense than ice cream and filled with rich fruit flavor. Peaches, nectarine, mint and lemon doing their work. 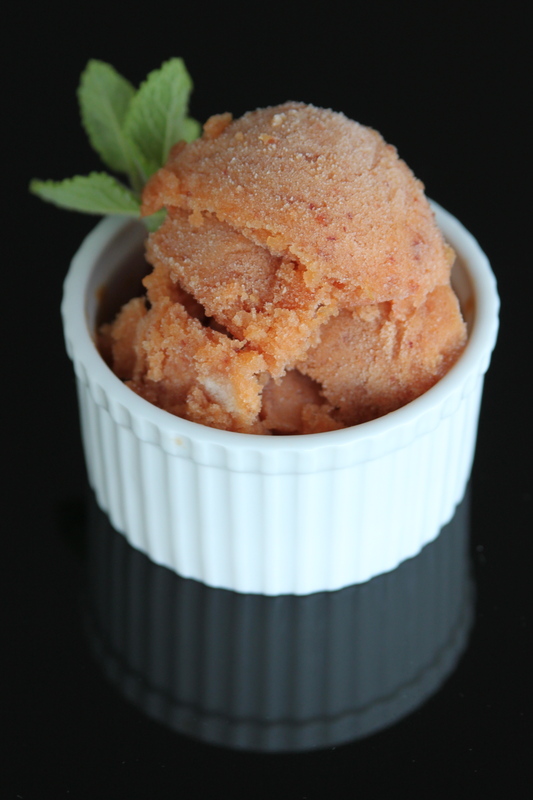 Top with mint for a nice presentation, or eat straight from your ice cream maker on a hot day. 1) Wash mint and dry. Remove leaves from stems and place to the side. 2) In a medium saucepan, combine sugar and cold filtered water. Place on low heat. Stir occasionally until sugar has dissolved, approximately 10 minutes. You do not want this mixture to be rapidly boiling as you will be adding the mint shortly. 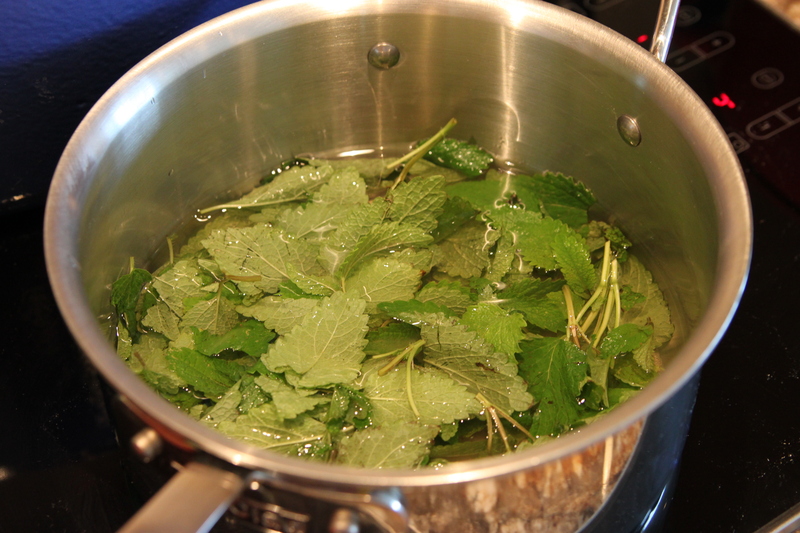 Once you have simple syrup (the sugar is completely dissolved) add mint to a gentle simmer. Keep on low heat for 5 minutes, then remove. Let rest till the mint simple syrup has cooled to room temperature. 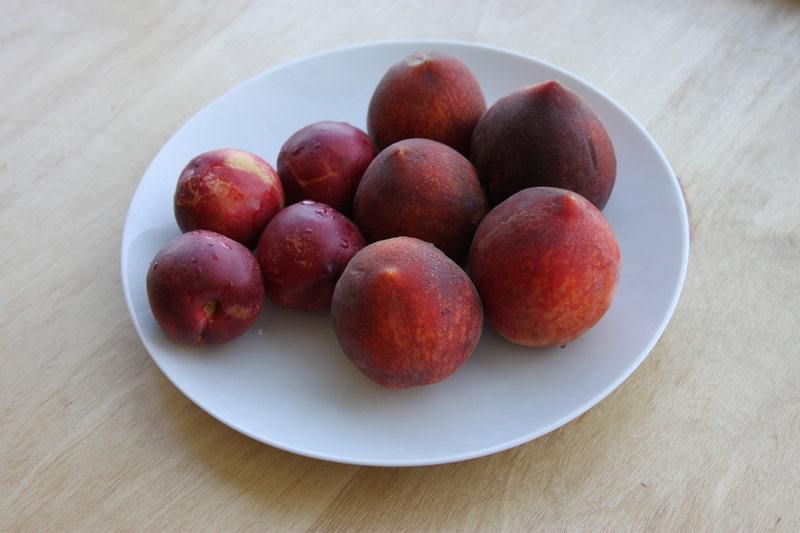 3) Wash and dry peaches and nectarines. Cut in half and remove the pits. Place in a blender or food processor. 4) Once your mint simple syrup is at room temperature you need to remove the wilted mint leaves. Pour the mixture through a fine metal strainer into your blender or food processor. Press mint leaves to remove all liquids and mint flavor. 5) Zest one lemon into a small bowl. 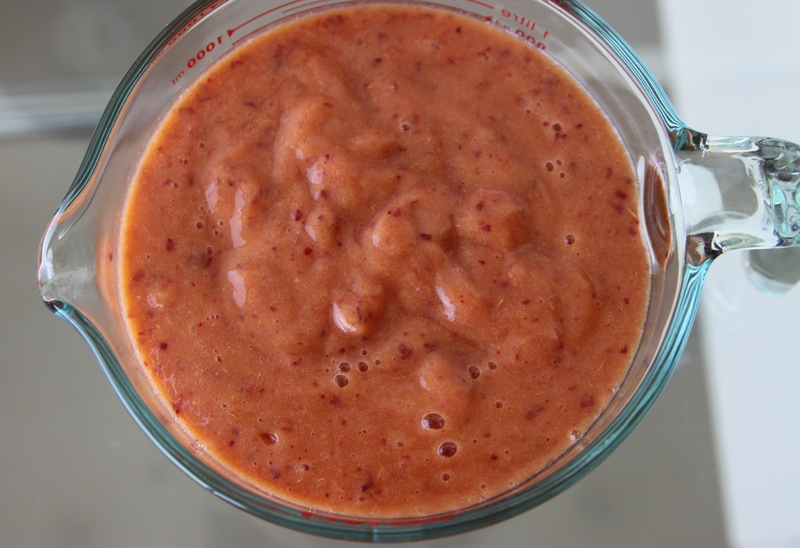 Then add zest to the blender or food processor that is filled with fruit and the simple syrup. Blend till mixture is pureed and smooth. I like to have some small chunks of fruit in mine. 6) Pour mixture into your ice cream maker and freeze according to manufacturer’s instructions. If your ice cream maker has a “gelato” or “sorbet” setting use it! 7) Serve with a fresh garnish of mint. 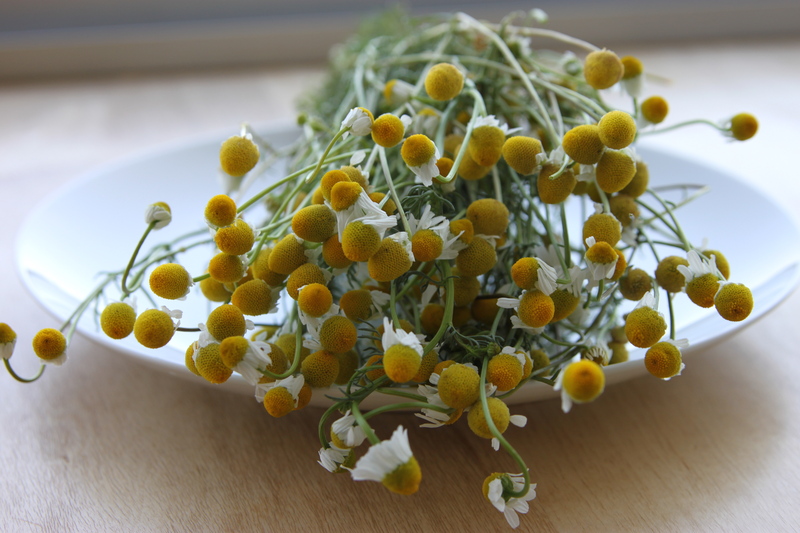 1) Wash and dry chamomile. Pour milk into a medium saucepan and place on low heat. Then add chamomile (stems and flowers) making sure its covered by the milk. Cook on low heat for 15 minutes to infuse the milk. 2) Remove the chamomile milk from the heat. Let cool to room temperature. Once cooled, pour the milk through a fine metal strainer to remove the chamomile flowers and stems. 3) In a large bowl combine milk, greek yogurt and honey. Stir to incorporate the honey. 4) Spoon the mixture into your ice cream maker. I used the “ice cream” setting for this to make it even fluffier and richer. 5) Serve as is. Or, this ice cream goes great with a host of desserts–try it with a semolina cake and you will not regret it.